His mind was truly incomparable. Stephen Hawking, one of the greatest minds of our lifetime, has passed away – leaving behind a lot of heartbroken science fans. While he was publishing papers right up until the months before his death, it was in 2016 that he released one of his most talked about journal articles – a long-awaited solution to his black hole information paradox. The paper was finally released in Physical Review Letters, published 6 June 2016 – and it made headlines around the world. Our original understanding of black holes, according to Einstein’s generally theory of relativity, is that everything that crosses the event horizon – the boundary of a black hole – is lost forever. Even light can’t escape its clutches, which is why black holes are called black holes (and also why it’s impossible for us to actually see one). Because of this, eventually, black holes can disappear, and the only remaining trace would be the electromagnetic radiation they emitted – which is known as ‘Hawking radiation’. The problem is that, according to Hawking’s best calculations, that radiation would contain no useful information about what the black hole ate – the information swallowed up would have been lost forever. And that doesn’t gel with our understanding of modern physics, which states that it’s always possible to reverse time. In theory, at least, processes in the Universe will look the same if they’re running forwards or backwards. Hence the paradox. And it’s actually a big deal not just for astrophysicists, because if the rules of quantum mechanics don’t hold up for black holes, then what’s to say they apply to the rest of us? But in 2016 Hawking proposed a solution to the problem – black holes might actually have a halo of ‘soft hair’ surrounding them, which are capable of storing information. That ‘hair’ isn’t actually hair – as you might have already assumed – but is actually low-energy quantum excitations that carry with them a signature pattern of everything that’s been swallowed up by the black hole, long after it evaporates. “That pattern, like the pixels on your iPhone or the wavy grooves in a vinyl record, contains information about what has passed through the horizon and disappeared,” wrote Overbye at the time. To come to this conclusion, Hawking identified two underlying problems with his original assumptions, which is why he says his original calculations – which suggested that the information inside a black hole would be lost forever – were wrong. Those two assumptions were that the vacuum in quantum gravity is unique, and that black holes have no quantum ‘hair’. That’s getting a little complex, but what you need to know is that Hawking has since revised his calculations, and is fairly sure that black holes have ‘soft hair’ haloed around them. This hypothesis was peer-reviewed and published in Physical Review Letters [link is above], and researchers are claiming that, while there’s more work to be done, it’s a promising step towards solving the information paradox. “It is important to note that this paper does not solve the black hole information problem,” wrote physicist Gary Horowitz from the University of California, Santa Barbara, in Physics. 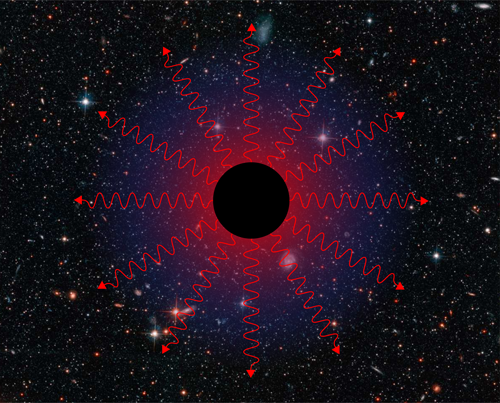 Physics Figure 1: Hawking, Perry, and Strominger suggest that black holes might have “soft hair,” low-energy quantum excitations that release information when the black hole evaporates. APS/Alan Stonebraker. “First, the analysis must be repeated for gravity, rather than just electromagnetic fields. The authors are currently pursuing this task, and their preliminary calculations indicate that the purely gravitational case will be similar,” he added. His criticism is that it’s still unclear whether all the information swallowed up by a black hole really can be transferred to the soft hair – rather than just an energy signature of everything that’s been lost. And that would certainly be a red-letter day in physics. Because we’d be one step closer to understanding some of the biggest enigmas in the known Universe – the weirdness that are black holes.